Mio offers skiers hills, forests and a lot of snow. Exotic destinations for cross-country skiing? How about Traverse City where you can ski from one vineyard tasting room to the next? Or the ski-in resort of Stokely Creek Lodge in the Algoma Highlands of Ontario? Or skiing from inn to inn along the Catamount Trail in Vermont? This winter skip them all and go where none of your Nordic friends have probably gone before. Ski Mio. This northern Michigan town of less than 2,000 residents in the heart of Oscoda County is hardly ever in the conversation as a bucket-list destination for cross-country skiers. There’s no four-star resorts. No restaurant listed in the Michelin guide to fine dining. No Gucci store or pampering spa where you can go for a hot stone massage after a day on the trails. Fine dining in Mio is the homemade polish sausage at Walker’s Bar & Grill, followed by a couple frames on one of the six bowling lanes in the back. But from a purely Nordic point of view, Mio has a lot going for it. 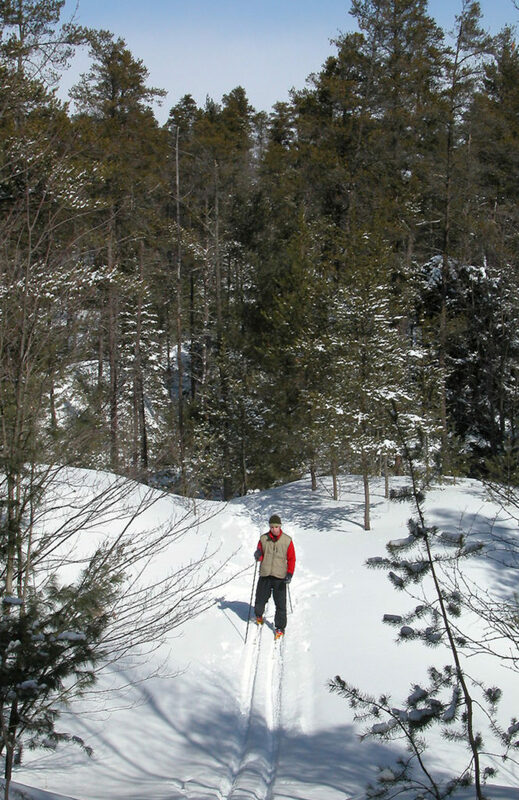 Most important the Au Sable River runs through it and the Huron National Forest surrounds it, providing scenery and the wooded terrain most skiers prefer. It’s hilly, a town that is practically surrounded by 1,300-foot ridges, including Mio Mountain, a former downhill area. And because of that elevation, Mio often records more than 70 inches of snow in the winter. The trails are never crowded and, best of all for weekend warriors, not that far away. From metro Detroit, Mio is a shorter drive than Traverse City. From Flint the ski trails are less than two hours away and, if you live in Bay City, in only 90 minutes you’re at the trailhead pulling the skis out of the back of your car. On the edge of town are three trail systems – Loud Creek Ski Trail, Wolf Creek Trail and the Mio Nature Trail – which are managed by the U.S. Forest Service. Only 2 miles southeast of Mio, Loud Creek Ski Trail is ideal for skiing because it’s relatively flat near the Cauchy Road trailhead but the further south you ski into the 920-acre tract the steeper the hills. From one end to the other, there’s a 230-foot difference in elevation and slopes with grades of 25 percent or more. Wolf Creek Trail is described by the U.S. Forest Service as a “semi-primitive experience.” Yet it’s main trailhead is located right in the heart of Mio. Wolf Creek Trail was rebuilt in 2012 and today totals 4.8 miles along four loops with most of them adjacent to the system’s main feature – almost 3 miles of the Au Sable River. If you’re seeking a more wilderness experience that’s just a short drive away. Thirty minutes to the east is the Hoist Lakes Foot Travel Area, a 10,600-acre slice of the Huron National Forest that contains seven lakes, 1,200-foot ridges, 20 miles of trails and a quietness that can only be found deep in the backcountry where snowmobiles are banned. Thirty minutes to the west is Wakeley Lake Semi-Primitive Nonmotorized Area, a 2,000-acre tract that is laced with old logging roads and an 8.5-mile network of marked trails and loops. The most interesting trails skirt the center-piece lake for an outing around a scenic body of water with a good chance of encountering a variety of winter wildlife.